The coordinates and momentum of individual beam particles are registered before entering the decay region by 3 silicon pixel tracking detectors (GTK) tracking detectors. A large-acceptance, magnetic spectrometer with tracking detectors (STRAW Tracker) in vacuum are required to detect and measure the coordinates and momentum of charged particles originating from the decay region. These are backed-up by a ring-imaging Čerenkov (RICH) counter to identify pions with respect to muons. 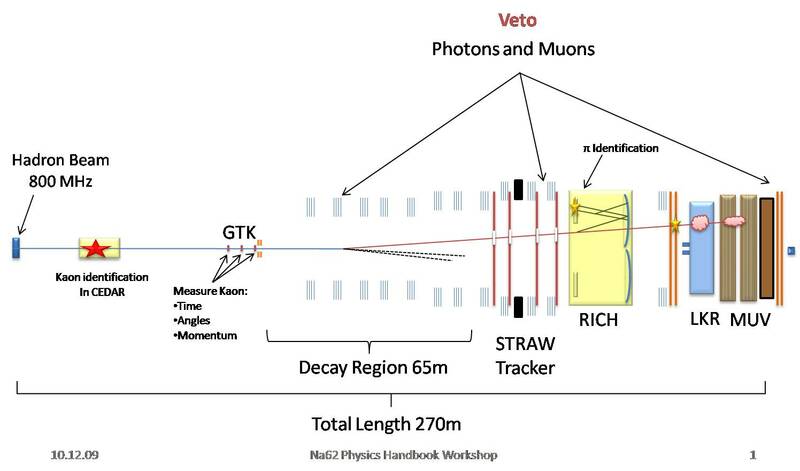 A set of photon-veto detectors provides hermetic coverage from zero out to large (~50mr) angles from the decay region. This is assured by the existing, high-resolution, e.m. (LKR) calorimeter, supplemented, at small and forward angles, by intermediate ring (IRC) and small-angle (SAC) calorimeters and, at large angles, by a series of annular photon-veto (LAV) detectors. The LKr calorimeter is backed up by muon-veto detectors (MUV), composed of a two-part hadron calorimeter followed by additional iron and a transversally-segmented hodoscope. This system supplements and provides redundancy with respect to the RICH in the detection and rejection of muons. These detectors are complemented by ‘guard-ring’ counters (CHANTI) surrounding the last GTK station, to veto charged particles upstream of the decay region and a transversally-segmented, charged-particle hodoscope (CHOD), covering the acceptance and located between the RICH and the LKr calorimeter. All these components of the detector are inter-connected with a high-performance trigger and data-acquisition (TDAQ) system.